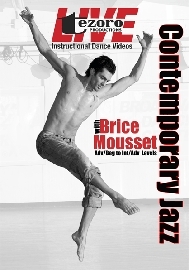 Learn a European inspired Contemporary Jazz routine with Brice Mousset. His unique style is a fusion of European contemporary, jazz and ballet. In this 60-minute video, Brice will teach you three different routines designed for the intermediate to advanced dancer focusing on the musical dynamics, quality of movement and varying tempos.